Like many of you, I find myself in constant conversation with new people about the Animal Justice Party, and it is a profoundly important form of 'outreach'. Sometimes I can give them the 1 minute version of what we are all about, and can see they are really thrilled to learn about us and want to get involved. I often tell them of our success in having an MP elected in NSW, our success in having the law changed around puppy mills and (we hope) BSL and animal testing, our increasing vote at each election. I wear my AJP branded T-shirts and Hoodie to a lot of the animal events I attend, and that often gets the conversation started with "What is the Animal Justice Party?". Others do this work at our organised stalls around town. We give our flyers, and more importantly, chat with people about our role and our progress. Many of our current members have been contacted in this way. The first rule of the Animal Justice Party is to TELL PEOPLE about the Animal Justice Party! There continues to be strong movement towards the aim of this campaign, to implement a complete ban of animal-tested cosmetics in Australia, manufacturing, sales and import. 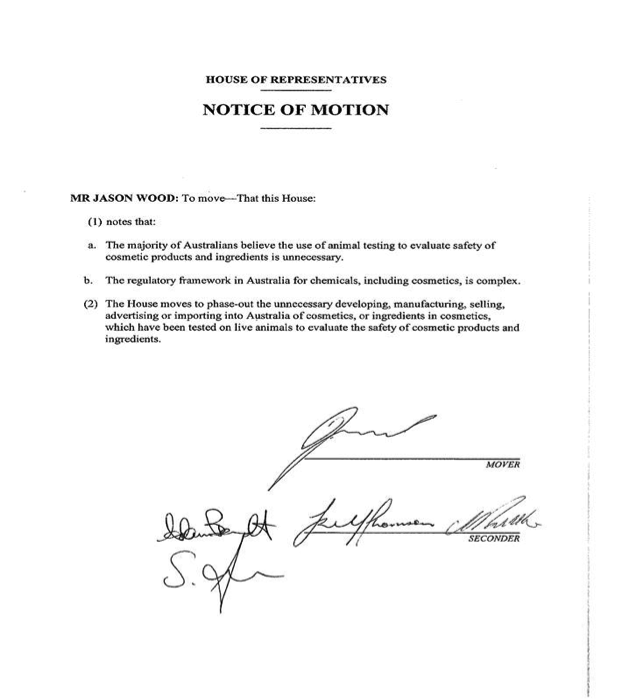 The latest good news is that Jason Wood MP is to propose a Private Members Motion in the next sitting of the House Of Representatives calling for a review of the regulatory framework for chemicals including cosmetics with the intention of phasing out the unnecessary developing, manufacturing selling, advertising or importing of cosmetics or ingredients in cosmetics which have been tested on live animals. Jason is already known to us for his work in banning the import of hunting trophies last year, for which he has received global commendation following the shocking poaching of Cecil the Lion from a national Park in Zimbabwe. Australia leads the world in banning these grisly trophies. 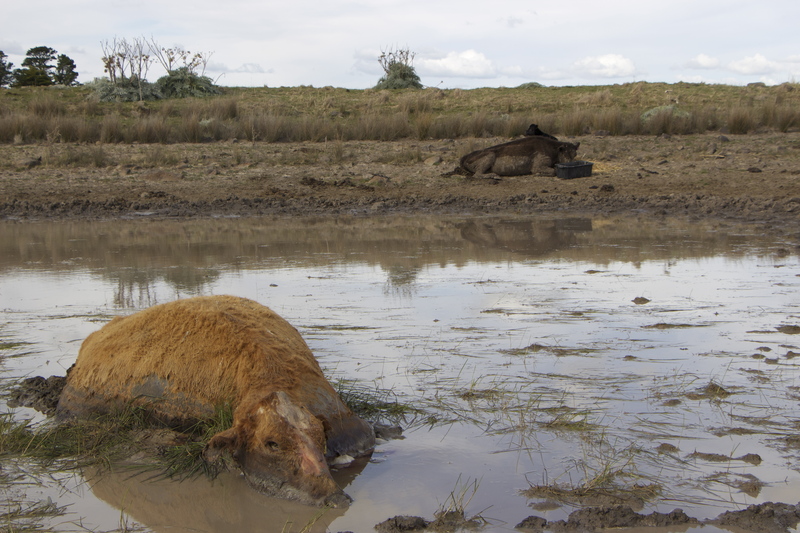 We have posted on Facebook a number of stories about the cruel treatment of cattle and their calves on a farm just North of Melbourne Airport. We are following this up as far as we can, with a view to helping the animals directly. But, as a political party, we are also aware of a much bigger picture, and the need to achieve sustained and permanent structural and legal changes to help more animals like these. And those issues we will take up with the government and opposition. - Marketing: Various promotions and campaigns we would run, if we had somebody to run them. - IT: We are developing and integrating new websites and membership management systems. - Campaign Managers: Anybody who wants to get involved in our political campaigns to help animals. - Election Campaign staff: The Federal election approaches. We need to organise for it. Our next monthly meeting is this Thursday, 27 August at 6:30pm, Ross House at 247 Flinders Lane in the CBD. There will be a report and discussion of current campaigns, upcoming elections and everything else going on in the party over the next few months. As well as that, we want to discuss the best themes and campaigns leading in to the next election.